Updated With Cover.Are British tabloids as obsessed with death of Princess Di as American Tabloids? 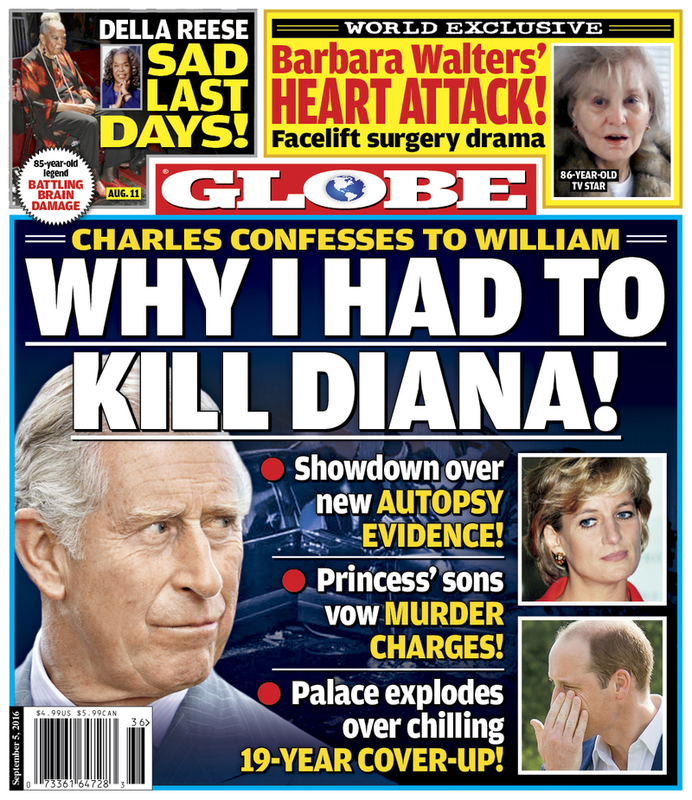 The latest Globe says Charles confesses to having Princess Di killed and William and Harry want dad arrested. This is odd. Globe has always showed Charles as a schmuck who probably can’t tie his shoes. The headlines are always about either Camilla is conspiring to dethrone Queen Elizabeth and install herself as Queen. Or conspiring to stop Queen Elizabeth from stepping down and making Duchess Kate as Queen. Camilla really hates Kate with the intensity of a billion suns. Camilla is portrayed like a Grimm Fairy Tale Evil Stepmother but a billion times worse. Now Charles is shown as a master criminal that eluded both French and British police for 20 years. Make up your mind Globe writers. Do you in England have to put up with the same gabage in your checkout aisles in grocery stores or anywhere? Do your tabloids have same conspiratorial obsession with Princess Di death and manipulations of Camilla? I have read the British seems more tolerant of Camilla then Americans.